So there's some serious snow on the ground here.... fortunately my roommate and I are well stocked and are using our snow days to watch as many Oscar nominated films as possible, drink prosecco, play board games, and eat all the cheese. We figured we might be snowed in for a while, so stocked up before the storm and have since made hummus, veggie pizza, a kale, sweet potato, & goat cheese tart, mushroom soup, and three different kinds of pesto (because you can never have too much pesto). While all our snow cooking adventures have been fun, it's also nice to have easy fallbacks to make when you feel the need to eat healthily and/or make something quick and simple. Enter the kale/quinoa salad. It's incredibly basic (in every sense of the word) but I love it. The kale is raw but the lemon and warm quinoa help relax the leaves so they have a soft texture but keep their fresh flavor. I often make this on Sunday and then take it for lunch throughout the week (it keeps for about a week in the fridge and can be eaten warm or cold). I'll add a dollop of yogurt to this salad or eat it on top of a roasted sweet potato. If I wasn't allergic to eggs, I would probably add a fried egg and call it dinner. Rinse and cook the quinoa in a small pan. While the quinoa cooks, tear and wash the kale. In a large bowl, massage the lemon juice into the kale. Finely dice the red onion. 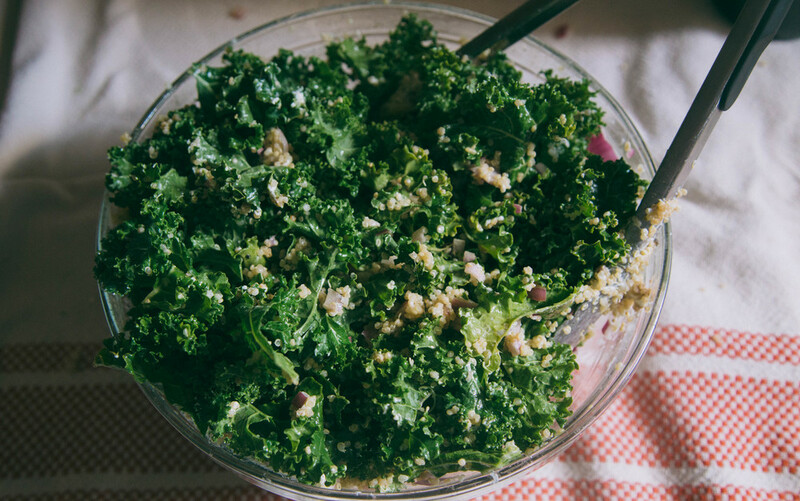 Add quinoa and red onion to the bowl of kale. Crumble in the goat cheese, pour in the balsamic vinegar and olive oil, and season generously with salt and pepper. Mix vigorously.